Emily knew there would be strings attached when she relocated to the small town of Willow Creek, Maryland, for the summer to help her sister recover from an accident, but who could anticipate getting roped into volunteering for the local Renaissance Faire alongside her teenaged niece? Or that the irritating and inscrutable schoolteacher in charge of the volunteers would be so annoying that she finds it impossible to stop thinking about him? The faire is Simon's family legacy and from the start he makes clear he doesn't have time for Emily's lighthearted approach to life, her oddball Shakespeare conspiracy theories, or her endless suggestions for new acts to shake things up. Yet on the faire grounds he becomes a different person, flirting freely with Emily when she's in her revealing wench's costume. But is this attraction real, or just part of the characters they're portraying? 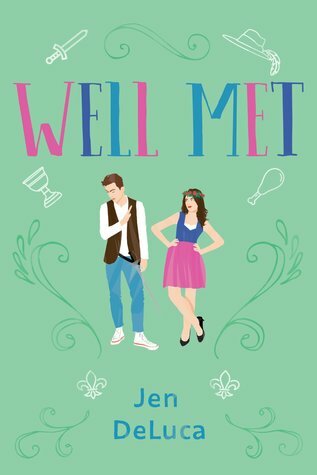 This summer was only ever supposed to be a pit stop on the way to somewhere else for Emily, but soon she can't seem to shake the fantasy of establishing something more with Simon or a permanent home of her own in Willow Creek.